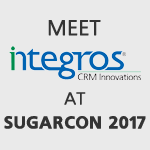 We’re just two weeks away from SugarCRM’s premier event – SugarCon 2017 – in San Francisco. We can’t wait to host more than a thousand Sugar experts and users, CRM industry visionaries, and customer experience experts for three days packed with entertaining keynotes, educational breakout sessions, and (of course) fun parties and networking events. This year’s SugarCon celebrates the CRM heroes who are always looking for new ways to “save the day” for their organizations. In that spirit, you won’t be just a name and badge at another tech conference. We have crafted SugarCon to be a celebration of heroes and a participatory event where everyone can share their story. Are you going to SugarCon 2017? Visit Integros booth!